Junho’s voice is currently one of my favourite voices in Korean music industry. I particularly love it because Junho has this rock feel, and with this in mind, I enthusiastically expected that he’d come with more rock songs in his solo album. But then it didn’t meet my expectation. No rock songs like Say Yes, Junho delivers sweet pop songs instead. Well, nothing’s wrong with that. He’s famous as a pop star anyway. But couldn’t this fan get something different from his solo album? That was my initial response to his Japanese solo debut, Kimi no Koe (Your Voice). However, after listening to it several times, I’ve grown loving this album. Not as much as I love 2PM’s Grown but Kimi no Koe is a record that I’ll listen to again and again. 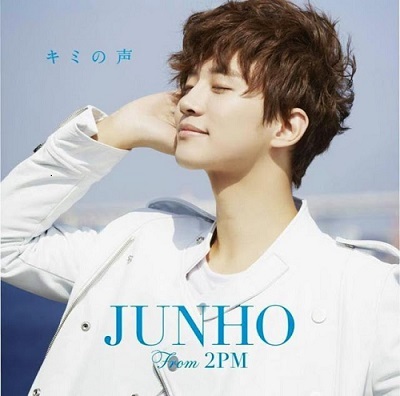 The album starts with Kimi no Koe, the song Junho admitted he wrote for Hottests. It’s a charming pop song for the summer, and the music video highlights that idea. Junho doesn’t show his amazing singing skill for this song, but I guess it’s not really needed since the charm of the song lies on its simplicity. In Like A Star, Junho’s voice is accompanied by a full band. Most 2PM’s songs before Grown are heavy on synth and keyboards that sometimes distort the boys’ great voices, meanwhile singing with ‘organic’ music (borrowing Sam Endicott’s phrase) reveals their true talent. This is what I found in Like A Star. Junho’s voice gets along perfectly with the musical instruments. The next song Close Your Eyes reminds me of Be With You, which he composed for Wooyoung’s solo album. Like Be With You, Close Your Eyes is a slow, sensual R&B track. The difference is while we could hear some innocence in Wooyoung’s voice in Be With You, in Close Your Eyes Junho sounds teasing with his falsetto. R&B isn’t my favourite genre but this song has won my heart. Goodbye tricked me at first. I thought it would be a sad song only accompanied by a piano and a heartbreaking sound from the string section, but then it elevates into a dance track. Not a bad one, but I think this formula belongs more to Eru, not to Junho. After Goodbye as the climax of the album, the simple I Love You closes it modestly. The acoustic guitar gives the casual atmosphere to the song, and again Junho sings unpretentiously, highlighting the laid-back ambiance. Version B of the album provides three bonus tracks, which are Heartbreaker, the Japanese version of I’m in Love and the live version of Say Yes. The Japanese version of I’m in Love isn’t really different from the original. From all songs composed by Junho, I’m in Love is on the top part of my list for its catchy beat . But actually the hidden gem here is Heartbreaker. The bass sound is brilliant and different from the other songs in this album, Heartbreaker sounds darker with lyrics that state the persona is a, well, heartbreaker. I also ask you to listen to the live version of Say Yes. In general, Junho could sing in various genres, yet songs like Say Yes give room for Junho to expose the rock side of him which I adore so much. One thing to underline is that he always delivers this rock quality effortlessly. Released in summer, Kimi no Koe is the right soundtrack for the season. I guess that’s why to match the summer feel, this album isn’t packaged as something ostentatious. With a sold-out Zepp tour and a well-received solo album, this summer truly belongs to Junho. And as a fan of his voice and talent, I couldn’t be any happier. Categories: music, review | Tags: 2PM, Junho, Lee Junho | Permalink.